In the spirit of The Dark Knight Rises coming out this Friday, the look for this week is a Batman themed ensemble. A lot of my geeky outfits start with one piece, and grow from there. This Batman themed outfit was no exception. I started with the leggings, and the rest of the look pulled together naturally after that! I picked up this awesome Batman logo shirt from Hot Topic. it’s flattering on the body and so different from all the standard t-shirts out there. You could also make a shirt like this yourself by following Lindz’s shirt painting tutorial. 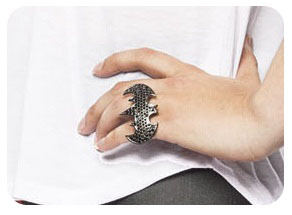 How can I put this…I am a RABID fan of Black Milk Clothing! 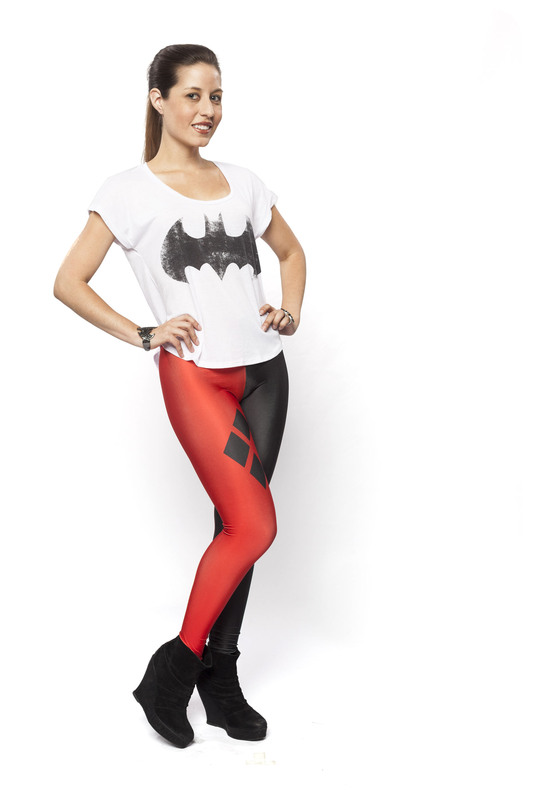 They’ve got some really great prints and styles that go so well with so many geeky ensembles. 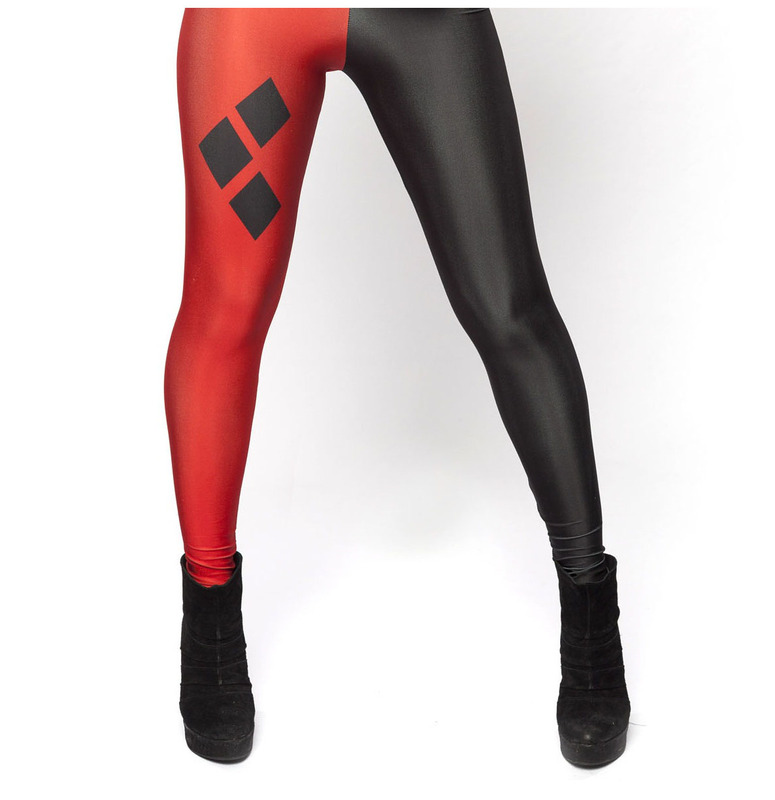 I jumped at the chance to get their Harley Quinn inspired leggings, which sadly are no longer available. But you can check on eBay to see if any come up for sale on there, or you could try getting your own pattern printed from places like fabricondemand.com. I already owned these ankle boots, and use them for a lot of my outfits. It’s always good to have some go-to shoes that are versatile enough to work with a variety of looks. 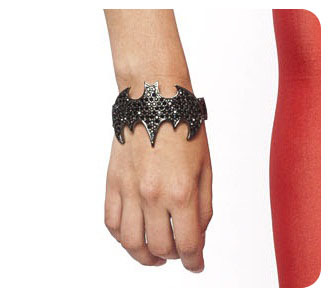 There are a few jewelry lines, like nOir Jewelry, that have licensed with companies like DC Comics to make geeky jewelry, which is where my bracelet and ring are from. While some of their DC items are pretty rad, their price point leaves a lot to be desired. I’d highly recommend checking out eBay to find similar, but affordable, pieces. I hope you’re enjoying the weekly looks we’re bringing you, as there are plenty more to come! We saw quite a variety of stylish geeky outfits at Comic Con this past weekend, it’s so great to see what everyone comes up with and to see that geek style is more prevalent than ever! Don’t forget, if you have a geeky ensemble you’ve pulled together, please share it with us on Facebook! And thank you so much to those that have started to share your looks with us already, we absolutely love them. Keep geekin’, keep stylin’!